Lettuce, tomatoes, cucumber, red onion, avocado and olives are tossed in a creamy dressing with the flavor boost of Pace® Picante Sauce. 1 Stir the Pace® Picante sauce, mayonnaise and sour cream in a large bowl. 2 Layer the lettuce, tomatoes, cucumber, onion and avocado in a large bowl. Spoon the picante sauce mixture over the top. Sprinkle with olives. Serve immediately. 1. Stir the Pace® Picante sauce, mayonnaise and sour cream in a large bowl. 2. 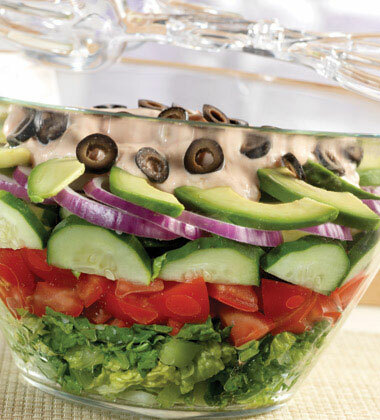 Layer the lettuce, tomatoes, cucumber, onion and avocado in a large bowl. Spoon the picante sauce mixture over the top. Sprinkle with olives. Serve immediately. Serve with Grilled Orange Picante Pork Chops and 1/2 cup of honeydew for a meal less than 500 calories.